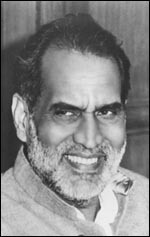 Shri Chandra Shekhar was born on July 1, 1927, in a farmer's family in village Ibrahimpatti in District Ballia, Uttar Pradesh. He was President of the Janata Party from 1977 to 1988. Shri Chandra Shekhar was attracted to politics from his student days and was known as a fire-brand idealist with revolutionary fervour. After his Master's Degree in Political Science from Allahabad University (1950-51), he joined the Socialist Movement. He had the privilege of having been associated very closely with Acharya Narendra Dev. He was elected Secretary of the District Praja Socialist Party, Ballia. Within a year, he was elected Joint Secretary of the U.P. State Praja Socialist Party. In 1955-56 he took over as General Secretary of the U.P., State Praja Socialist Party.